This private food and wine tour from lisbon will show you how we really make our wines. We will visit two wineries in the Arrabida Mountains. Come and explore the impressive natural landscapes of the Arrábida Mountains and, at the same time, get to know the flavors of the region’s several wines. The tour starts in the Arrábida Natural Park, stopping in several viewpoints along the way. 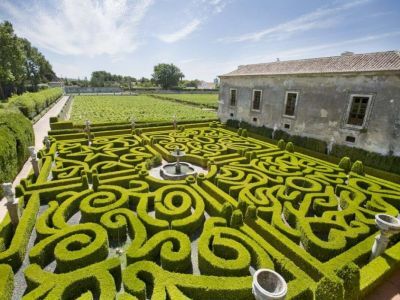 We start with the Quinta de Alcube and then we visit the Casa Museu José Maria da Fonseca, with a guided tour of its gardens and old cellars where the oldest collection of Moscatel Wine resides. Lastly, we visit the famous Quinta Palácio da Bacalhoa, dated from 1480 where we’ll see the Palace, the vineyards and the cellars. You can choose to do an 4 hour tour, visiting only 2 wineries and without lunch stop, or an 8-hour tour, visiting 3 different wineries. 01:00PM( 4h Tour )/05:00PM( 8h Tour ): Drop off at your hotel, the airport or cruise port. Transportation in a fully equipped car. 2 or 3 winery visits, which include visit to the gardens and cellar and wine tastings.